Data continues to come in relatively strong with last week’s employment report offering mostly good news. The January data continued to post positive momentum, supporting the bullish case for stocks. Friday’s January employment report was not an exception. One last area to consider is wages. 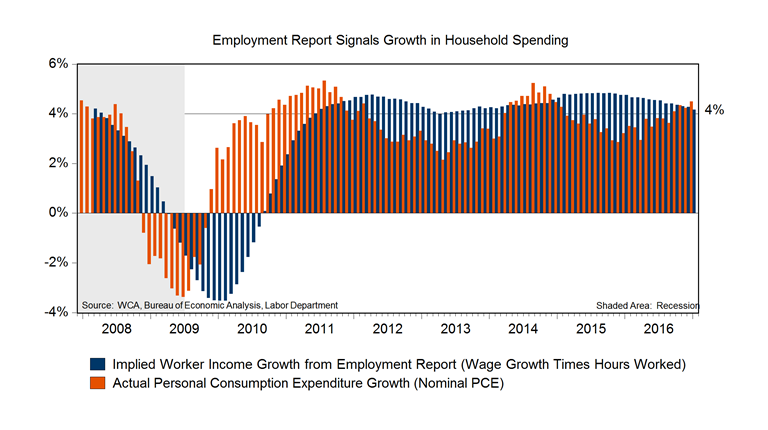 Consumer demand continues to be relatively steady, but is dependent upon wages. Personal consumption is accelerating toward a 4.5-5% range, while implied income growth from the employment report suggests moderation. Typically, the implied growth from the employment report leads the actual personal consumption data by a few months. This is worth watching as the year progresses as it implies slower growth ahead. Overall, the employment report was a solid one. It reinforces the slow-and-steady growth dynamic we are seeing across a broader set of indicators. It also contributes to a body of evidence that is mostly equity market friendly. FactSet estimates S&P 500 earnings for the fourth quarter is tracking toward 4.6% growth. Expected S&P 500 operating earnings now stands near $133.54 over the next 12-months, according to FactSet’s analyst survey. At this Level, the S&P 500 trades at 17.1x earnings or 19% above the 10-year average multiple.